The presentation will take place in the Harvestworks audio gallery starting with TELLUS #1 through TELLUS #27 played in one hour segments starting at 3 pm until midnite on the following days: Thursday, November 11 – Issues #1 – #9 :: Friday November 12 – Issues #10 – #18 :: Saturday November 13 – Issues #19 – #27. TELLUS was created in 1983 at the Rum Runner Bar on Canal Street in New York City. Joseph Nechvatal, a visual artist, Claudia Gould, a curator and Carol Parkinson, a composer and staff member of Harvestworks/Studio PASS met to discuss the idea of a magazine on cassette that would feature interesting and challenging sound works. 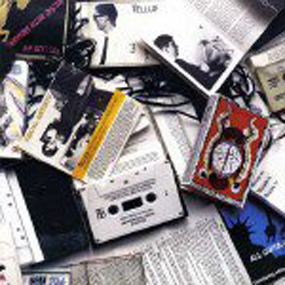 With the advent of the Walkman and the Boom Box, the editors perceived a need for an alternative to radio programming and the commercially available recordings on the market at that time. AS A TEAM they began to collect, produce, document and define the art of audio through publishing works from local, national and international artists. We worked with contributing editors, experts in their fields, who proposed themes and collected the best works from that genre. Unknown artists were teamed with well-known artists, historical works were juxtaposed with contemporary and high art with popular art, all in an effort to enhance the crossover communication between the different mediums of art – visual, music, performance and spoken word.